NOTE: Beginning with version 2.4.17+ you MUST install Libstub and LibAddonMenu separately. Azurah enhances the interface by providing additional information and customization options while maintaining most of the stock look and feel of the game's standard UI. Unlock the interface windows allowing them to be moved anywhere on the screen and scaled in size. NEW: 'Undo Changes' button and right-click ability to undo changes to single windows since unlock. Set a minimum level of transparency for your attributes or have them always shown. Lock the size of your attributes so food no longer makes them larger. Display text overlays showing your and your target's attributes. Show an overlay displaying your current level of Ultimate power. Colour the target's health bar, name and level by its reaction to you, or its expected difficulty. Show other players by character name or @account name (or both) and other options. Set an overlay for your experience bar as well as setting it to always be shown. Several options to block accidental stealing when not fully hidden to avoid unwanted bounty. Show when your backpack's contents change with extra options to warn you when your bag is nearly full. Show a timer for the remaining duration of your Werewolf transformation. Ability to enable account wide settings to apply the same choices to all characters on your account. All of the above features include several options for personalization accessed from the Addon Settings menu under Azurah. - Updated French language support (thanks lexo1000 for completely remaking the French translation!). - Added fix to prevent custom position causing compass resize changes made using Wykkyd's Full Immersion to become reset when alt-tabbing. - Removed included Libstub/LibAddonMenu to avoid possible version conflicts in the future. - Fixed a typo in Manifest for Library loading. - Added missing strings to Japanese and French translations, minor formatting. - Maintenance adjustments to directory structure and language file naming conventions. - Changed behavior of the Undo and Exit options on the unlock menu. Now if you exit without saving your changes will remain until you unlock again and save or reload the UI, letting you test changes with the mover frames off. - Added a new icon indicator when there are changes pending which have not yet been saved. Clicking Undo changes or right-clicking all modified frames will will clear this icon, as will reloading the UI (when unsaved changes are lost). - Cleaned up the unlock mover frame. Resized background to fit all new buttons. - Added new chat commands to save, exit without saving, or undo changes, in addition to unlocking. - Added improved German translation provided by Baertram. - Cleaned up code and language files. - Added new option 'Undo Changes' which undoes all UI changes since Azurah frames were unlocked. Locking saves the changes. - Added new feature to right-click individual unlocked frames to undo changes made to just that frame since Azurah was unlocked. - Added new option to exit frame edit mode without saving. - Fixed docking of non-movable elements with attribute bars. - Temp fix for compass position compatibility with changes made via Wykkyd Full Immersion (needs more testing). - Fixed reticle/subtitle scaling bugs when using Wykkyd Full Immersion. - Fixed "theft was prevented" chat notifications showing when option is disabled. - Updated language translations and added German, Spanish, Italian, and Russian (Google only, needs human translation!). - Updated for Update 16. - Updated the code that handles the fading for the player attribute bars to allow for better and more natural fading. - Updated the size locking code for the player attribute bars to allow it to be changed regardless of buffs. - Updated the always shown feature for the experience bar to show when the loot window is open. - Removed the redundant CP level from the experience bar overlay. - Added a setting to disable the game's activity tracker. - Fixed a UI error that would occur when switching interface modes after the last update. - Fixed the positioning problems with player debuffs. - Fixed Stamina bar disappearing when "Visibility: When Full" was set to 0 and player was mounted. Stamina bar should always show when mounted now to avoid floating mount stamina bar. - Fixed Magicka bar disappearing when "Visibility: When Full" was set to 0 and player was in Werewolf form. Magicka bar should always show in WW form now to avoid floating WW power bar. - Fixed the shield health vanishing when the player's health changes. - Fixed the options to hide the target's @accountname and title, and the option to hide the @accountname from the interaction HUD. Also, this MAY solve the problem with guild kiosks not immediately showing the guild name that owns it. As an added bonus, toggling these options on and off no longer requires a reload of the UI. - Fixed the text for the new shield settings. - Fixed problems with the capture overly. - Fixed player buffs not being movable. - Fixed experience bar not showing properly when on default mode. - Added a shield health setting for the player and target health frames. - Added the ability to move the equipment status icons in gamepad mode. - Added the ability to move the battleground score. - Added new Thievery options: Safer Theft from Containers and Safer Pickpocketing which each prevent that type of looting if you are not actually hidden (if it would be a crime). Disabled by default. - Updated French translation (thanks lexo1000) and cleaned up formatting on others. - Updated French translation (thanks lexo1000). - Added new option to general settings to set the text alignment of the Notification Text frame. - Adjusted the unlocked control frame to appear above default movables. - Enabled moving the Reticle, Interaction (HUD) Text, and Sneak Icon. - Enabled moving the built-in player Buff/Debuff Tracker frame (beta only). 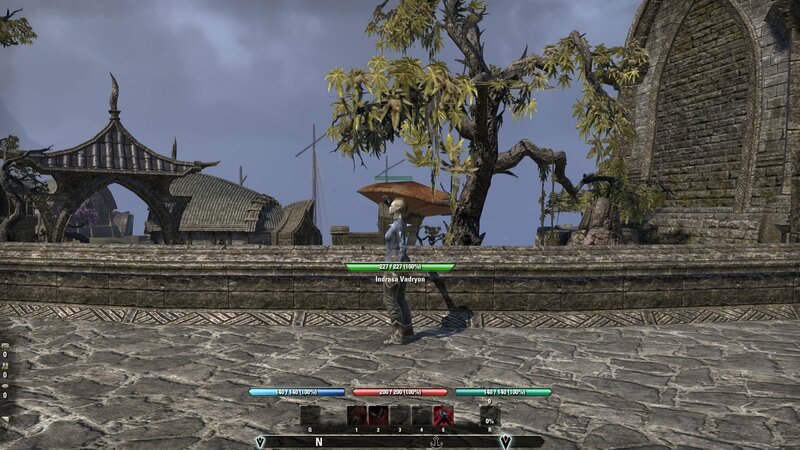 - Updated API to support Morrowind. 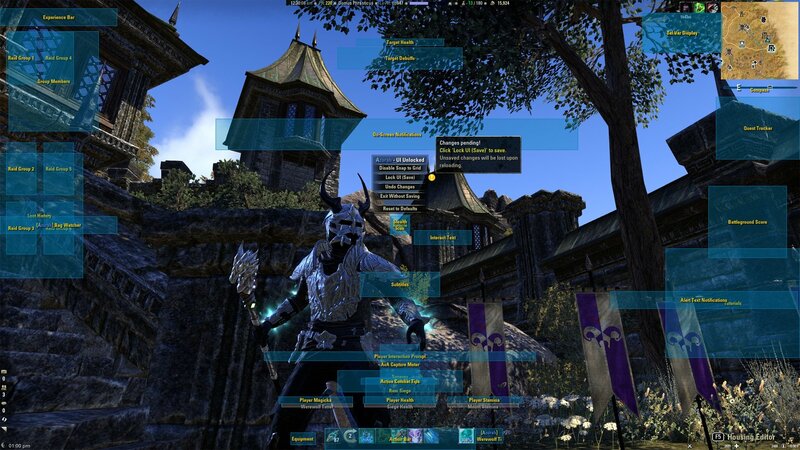 - Fixed mount stamina and WW bars not remaining anchored to player bars in gamepad mode. - Added option to hide player title along with the @accountname from the target frame. - Added option to hide the player head icon from the target frame. - Added new General option: 'Keyboard/Gamepad Mode Change Reload.' Reloads the UI when changing between Keyboard and Gamepad modes. Normally if you switch modes, position changes made in Azurah for that mode will be continually reset until manually reloading the UI. This is a workaround for a default UI behavior. Disabled by default. remember to always do a /reloadui first to finalize the switch or use this option. - Fixed some cases where certain saved variable configurations could cause nil errors. - Workaround for settings reverting until /reloadui when switching between keyboard and gamepad mode. NOTE: Switching modes will now automatically reload the UI. - Minor code tweaks for speed and efficiency (and great justice). - Re-uploaded without version change to fix embedded LibMediaProvider-1.0 folders causing error about missing library. - Fixed problem with player progress bar still resetting position when XP gained. - Added mover for gamepad mode specific quest timer. - Some other minor tweaks and changes. Moving loot history in gamepad mode is not likely going to be supported as re-anchoring the container causes "too many anchors" LUA errors. No workaround other than to completely recode the loot history in gamepad mode... Use LootDrop. - Fix scaled subtitle background alignment. - Improved the workaround for the Progress Bar position resetting. - Workaround to allow mover to function with player progress bar. - Prevent ultimate border from scaling incorrectly in gamepad mode. - Added ability to move/resize built in Loot History (keyboard mode only). - Added ability to move/resize Ram Siege vehicle info. - Added ability to move/resize Subtitles (keyboard mode only). - Updated libraries to latest. - Added ability to move the new equipment status indicators. - Updated LibAddonMenu to r22. - Updated API to latest. - Added Japanese localization (thanks k0ta0uchi!). - Fixed a bug preventing the class icon from showing when the option to show by nameplate was checked and target was champion ranked. - Fixed a bug that would cause no name to appear when someone invited you to a group when the option to hide @accountname from the player interaction frame was on. - Added new option to hide @accountname from player interaction menu. - Workaround for BagWatcher not updating. - Added new feature to hide the target's @accountname. - Updated for Dark Brotherhood. Replaced outdated API functions. - Updated to latest LibAddonMenu and LibStub. - FIXED: Fixed keybinds showing incorrectly due to mistake in previous fix! - Fixed the ultimate button's "decoration" not scaling properly in keyboard mode. - Fixed the accidental removal of Alert Text Notification area in keyboard mode. - Fixed the location of the target class icon not moving to the side of the heath bar. - Overhauled the Unlock UI functionality to support separate set-ups for keyboard and gamepad modes. - Changing should be seamless but there are some quirks still. - Resetting to default will now cause the UI to reload as its impossible to grab the default layouts for both upon login. - Experience bar overlays aren't available in gamepad mode due to the design of the UI in that mode. - Some other things may be missing in gamepad mode too but I plan to get them added as soon as I can. - Fixed the "Active Combat Tips" frame not actually getting moved. - Implemented a workaround for player attribute bars getting stuck as visible or showing the wrong stats (like after a death in Cyrodiil). They will fix themselves when one of them updates via player actions. - The target's veteran icon will now remain in the same place and the target class icon will adjust itself around it instead. - The AvA Capture Meter is now movable. - Applied tweaks for handling Gamepad Mode. Since supporting this new mode will require some major reworking of the add-on, the add-on will simply disable itself while this mode is active. - Applied a tweak to help with parts of the interface not positioning themselves properly upon login. - reverted some changes which could cause attribute bars visibility bug. - prevents stamina bar fading when full when mounted and mount stamina is not also full. - prevents magicka bar fading when full if transformed into a werewolf (timer is docked to magicka bar). - finally fixed for bossbar overlay? Re: Re: Anyway to remove debuff bar? Anyway to remove the debuff bar? Couldn't find anywhere in ui so I just moved to bottom right of my screen but it's still annoying. Apart from that great addon! Debuff bar is part of the game itself. Go to Settings -> Combat -> Buffs & Debuffs and disable it there. Re: Anyway to remove debuff bar? Anyway to remove debuff bar? while i can when i unlock azurah move the thing it doesnt appear where moved to, after saving instead beeing in the exact same place and overlapping my quests which i dont want to have in the middle of the screen to prevent overlapping with anything else... does anybody have an answer for it? moving any other ui element works just fine tho. Last edited by dar6a6 : 03/30/19 at 12:07 PM. Would it be possible to get a grid overlay option? It would help with aligning UI elements. Thanks for the continued support of this addon. Hi there, thanks for the awesome work. Would it be possible, when stealing on containers and not hidden, to not block the stealing but only toggling off the "Auto loot stolen items" setting ? That way, it won't be stolen, but we can see what it is (plus, press the action button to steal it as soon as we're hidden). Last edited by NTak : 03/30/19 at 05:57 AM. ... It is commented for the quickslot scene as it doesn't seem to have the double bar bug. The reason I included Quickslot UI is because PerfectPixel addon pushes the skill bar there halfway outside the game. I should have made a note of that, sorry. Last edited by Atavus : 03/09/19 at 01:55 AM. Hello - I just started using this addon and have a question regarding "NOTE: Beginning with version 2.4.17+ you MUST install Libstub and LibAddonMenu separately." 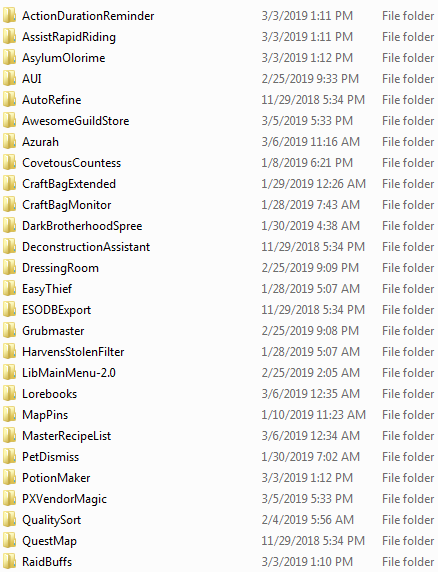 Do these need to be placed in the Azurah folder, or just in the addon folder? I have them in the Azurah folder currently and it's working fine, as far as I can tell, but wanted to double check. 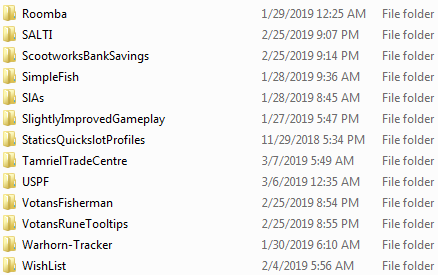 Those need to go in the main Addons folder. The reason it is working is that some other addon you use probably has them included in their package and loads them separately. I HIGHLY recommend you install this site's Minion Addon Manager and let it keep all your addons up to date for you. You can install them directly through that app as well as it searches this website. Thank you! I have installed Minion, that's why I wanted to understand how this worked (if it had to go into the Azurah folder, then it would be a pain with Minion). @Atavus: Nice catch! Been busy updating all my projects so hadn't had time to really dig into this one. It is commented for the quickslot scene as it doesn't seem to have the double bar bug. Yeah, the double skill bar issue only happens in the Skill UI. I have the same issue. Basically, the problem is related to only AUI and default game. AUI adds "ACTION_BAR_FRAGMENT" to the skills UI. That extra bar is overlapping with the original action bar, which is there in the default game. I made a quick and dirty workaround in AUI. - Comment out lines 711 to 734. - Do not touch line 735. @Phinix, real sorry as none of this relates to Azurah. Last edited by Atavus : 03/07/19 at 11:30 PM. Do you by any chance have PerfectPixel addon? AUI + PP produce double skill bar in Skills UI. The only addons that affect the action bar are AUI, Azurah, Action Duration Reminder, Assist Rapid Riding, and Dressing Room. This issue affects at least one other person as well, I remember seeing another post about it in AUI's comments. I'm pretty certain it has to do with AUI and Azurah though because using the "Use action bar of Azurah" only does fix the duplicate bar issue. However like I posted previously, I would prefer to use AUI's action bar over Azurah's. I know this is a minor bug, but it's been going on ever since I downloaded these two addons (this was also before I downloaded a bunch of other addons, had under ~5 at the time). Also, I just want to clarify - the overlapping bars occurs in the Skills window, not on the regular screen. My action bar & quickslots look fine on my normal screen. Last edited by Alexandriae : 03/07/19 at 06:16 PM. I made an updated translation for french but text is too long to send you via PM..
PP author said that "AUI [is adding] ACTION_BAR_FRAGMENT to the skills scene, which [he thinks] is completely unacceptable and not necessary". I am not sure how to fix this, but I left a comment on AUI page. Last edited by Atavus : 03/07/19 at 10:16 AM. If anyone really wanted to do me a solid and had some extra Crowns, sending a few Crown Crates to @IllusoryID on the PC North American megaserver is always be much appreciated!